Here is the transcript from my handwritten free writing from today’s exercise. In typing this out, I have preserved spelling, grammar, indents, and line and stanza breaks. I didn’t really have a form in mind. This looks poem-y, but doesn’t quite sound so. Consider the kitchen for a long moment. bathroom are important, but they do not sustain life. In the kitchen there is soap. from microbes — and waste. everyone but the tired cook. The tired cook can feel like the family’s servant. that for a long moment. Who sits in a dark kitchen? refrigerator hulk, faucet stem, paper towel roll. digital clock always glows, of course. in drawers and under the sink. We could sleep in the kitchen if we had to. warmth — with pallets around the edges. We save our unconscious hours for another room. 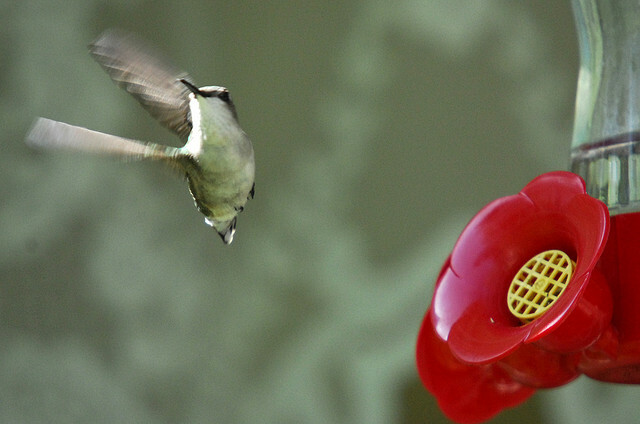 Image (top), “Ruby Throated Hummingbird,” by Eric Kilby on Flickr, via a Creative Commons license. Image of my handwriting by me. It’s evidence. 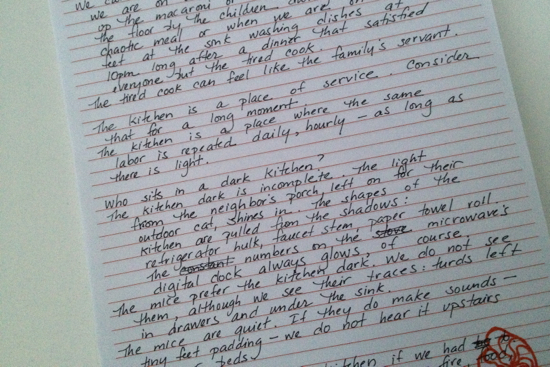 The reason I posted the above was because your draft reminded me of it in terms of the repetition (“In the kitchen there is . . .” and “A kitchen is a place . . . ” ). Maybe listing is somehow inherently connected to the “consideration” of a topic. Yes. Listing helps us document what is known (about topic), yet I also found it helped me discover, dig up, etc. There is a really good listing exercise which prompts the writer to think of a moment and then generate a bunch of sentences that all begin, “I remember.” As one writers, one remembers more and more. I also interject the predicate, “I don’t remember,” when I hit a block, and what I don’t remember also becomes rich material.